Does you or your next door neighbour require a Tree Surgeon in Belgravia? GraftinGardeners have been in the tree care business for many years and have extensive experience working in arboriculture. Our tree surgery services range from felling, to pruning, stump removal and more. Whatever tree services you need, we can supply them. We have tree surgeons in SW1W/SW1X, London and surrounding areas. Get in touch with us today and we can send a tree specialist to evaluate your trees, free of charge. GraftinGardeners are reliable tree surgeons serving in Belgravia and surrounding areas. We are a family run tree company, established in 2008, and accommodate for every type of tree work imaginable. All our teams are fully qualified and trained to the highest possible levels and always get the job done right, first time. If you require tree surgery in SW1W/SW1X, call our number above and we will arrange to have one of our tree specialists visit your premises and inspect your trees. Tree felling should always be carried out by a qualified professional for obvious reasons. It’s dangerous, you need lots of different cutting equipment, as well as ropes and wedges and the experience to perform it correctly. Our tree surgeons have felled hundreds of trees and can remove yours to. We cut down trees in sections (if there isn’t enough space to straight fell), in a well-controlled and staged environment. We closely follow UK felling laws, to ensure every fell is precise and no damage is caused to its surroundings. Before attempting to prune your own trees, you should first consult a tree surgeon as they can advise you on the most suitable pruning methods for your tree species. Our tree surgeons take a lot of factors in to consideration before making any cuts to a tree. These include age, size, shape, condition, character and species. We cut, trim and shape with these in mind, and closely follow the guidelines in British standards (BS 3998). We always get a clean cut and a perfect result. Do you have an unwanted tree stump that needs removing? Do you need it gone quick so you can lay some new lawn? Our tree surgeons can remove any annoying tree stumps no matter where there situated. We use the latest grinding equipment to take out stumps quick and without disruption. Our boys will come in, grind out the stump and compact the ground, leaving you with a clean site and a level surface. Storms can create lots of problems for your property and its surroundings when they blow down trees. Your home, car and driveway could get damaged, leaving you with a huge repair bill. When this happens, you need a team to clear up the mess, especially for large trees. If you need a fallen tree removed from your property, our experts can help. Our tree surgeons have removed hundreds of dangerous trees, so you can count on us to be there if you ever need us. When our team comes in, they will secure the surrounding area, cut up the fallen tree, load it onto the back of their truck, and clear up any mess left behind. Our emergency tree service is open 24 hours a day, 365 days a year, for all tree emergencies. If you don’t train your ivy properly, it will grow where you don’t want it and will often takeover whole trees and building very quickly. By letting it grow like this, you risk having it damage parts of your home. Some things that can get damage include, guttering, walls paintwork, windows, brickwork and roof tiles. If you have overgrown ivy and would like it removed, our arborists can help. We will come in, remove the ivy from its roots, lay down herbicides and burn any ivy waste left. Our company has lots of experience when it comes to tree cultivation and management. As an ex gardening company, we have planted many trees and shrubs in our time and can plant your new one for you or even relocate an existing one (without established root networks). Our arborists will source you a great specimen, plant it in the best location based on its species and will extend our hand to give you advice on tree aftercare to. Give your new tree the start it deservers, call GraftinGardeners today. GraftinGardeners provides tree services as well as a professional hedge trimming service and can cut, trim and shape any hedge. Our arborists are more than happy to come in and tidy up any messy shrubberies you may have and always get a perfect, clean cut. We can trim your box hedges, hedgerows or conifers, nothing is too big for us. We can also style and shape shrubs by either following your instructions, or letting us do it. Whatever your choice, we guarantee to leave you with perfect hedges. Pollarding a tree is hard work and requires lots of different equipment. It also requires knowledge of tree maintenance and pruning to perform it correctly. It is a severe cut back of branches, mostly at the top, to help promote new growth and denser foliage. It is regularly performed on willow and poplar species and can be a great way to contain them. If you need a tree pollarded, were the team for the job. 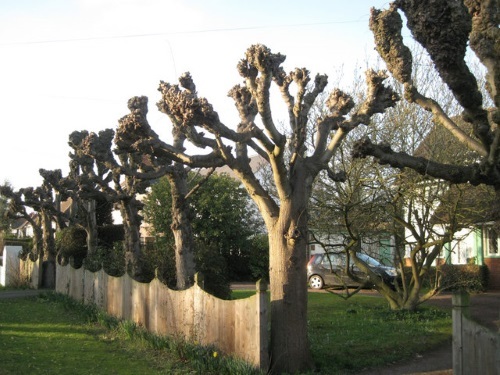 Our experience is unrivalled when it comes to pruning, so contact us if you need us.